“‘Haydn & the Creation – origin and reception history’ was the title of a two-day symposium sponsored by the International Joseph Haydn Private Foundation Eisenstadt (www.haydnfestival.at) and held there on the 28-29th August this year. Convened by its director Dr Walter Reicher, talks ranged from a survey of some 23 CD recordings, dating back to one conducted by Clemens Kraus in 1943 (Eva Stockler), to technical comment on the famous ‘Representation of Chaos’ (Denis McCaldin and Tibor Nemeth) and the Jewish perspective of the work (Caryl Clark). 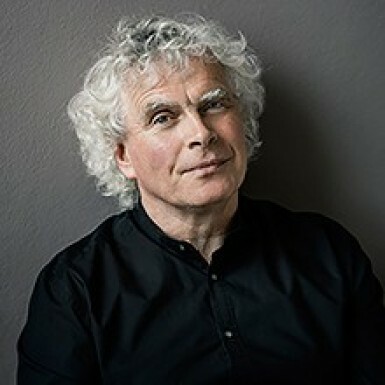 We were pleased to read that Sir Simon Rattle opened the new season at the Berlin Philharmonie on 25 August with a performance of Haydn’s The Creation. It is possible to catch up with the broadcast of this performance via this link. Sir Simon not only chose his own favourite movements for the pasticcio but also works that tell a story. The oratorio The Creation begins with an instrumental introduction representing chaos. Menacing timpani blows, swirling expanses of sound, dissonances and tentative chains of notes convey the impression of something in turmoil, in the process of formation, not yet concrete. It goes without saying, however, that everything is in order as far as Haydn’s composition is concerned, despite these elements of chance and disorder. The “Terremoto” (Earthquake) from the instrumental work The Seven Words of Christ on the Cross also depicts chaotic conditions. After the death of Jesus on the cross, the world is out of balance, the earth trembles – at least musically. The introduction to “Winter” from the oratorio The Seasons portrays, in Haydn’s own words, “the thick fog with which winter begins”. Another spectacle of nature – calm at sea, stormy seas and the gentle play of waves – is depicted in the overture to the Azione teatrale [theatrical action] L’isola disabitata. Haydn: An Imaginary Orchestral Journey is at the Barbican from 12-13 July 2017. We are very pleased to be able to support our friend, conductor Ben Palmer, in celebrating the 10th anniversary of his artistic directorship of the Orchestra of St Paul’s. 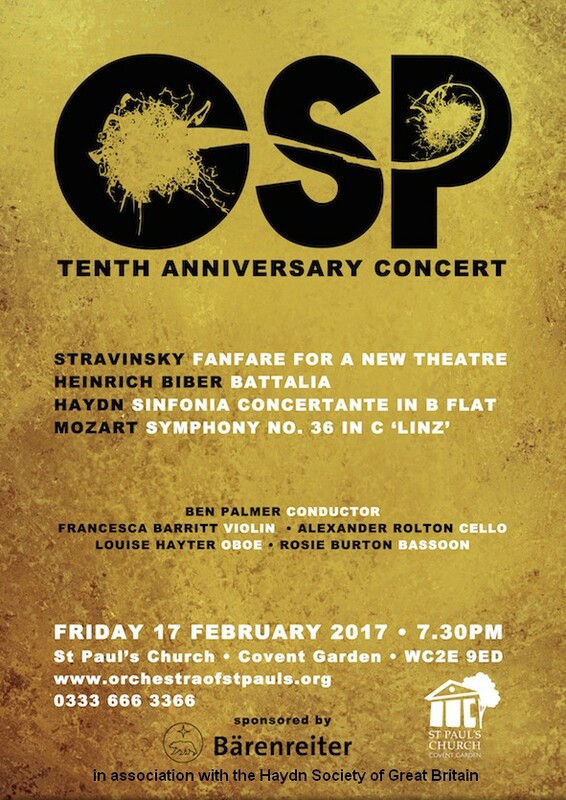 The concert on 17 February 2017, including a performance of Haydn’s Sinfonia Concertante in B flat, takes place in St. Paul’s Covent Garden, the venue for the concert we supported in 2016 of Ben’s new arrangement of Haydn’s Seven Last Words of Christ on the Cross. We are delighted to have heard news from the Winchester Music Club. 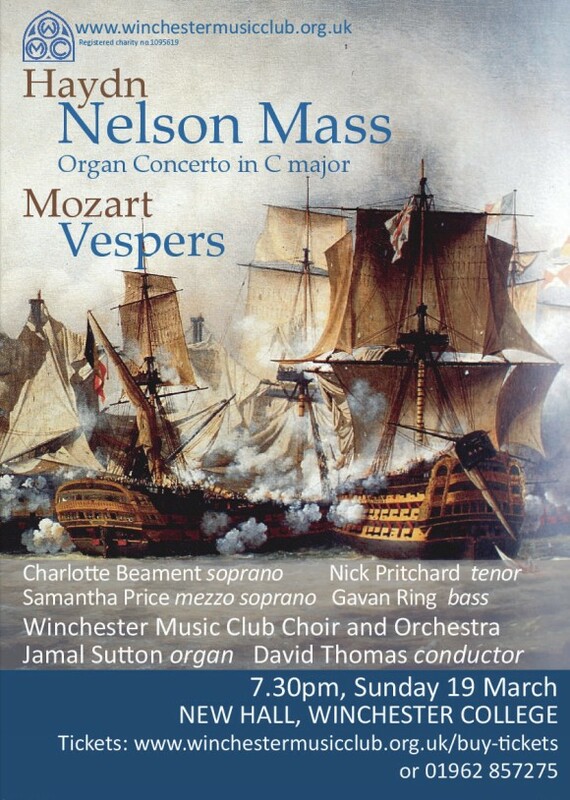 As part of the celebrations leading to their centenary in 2025, they will be performing all the extant and surviving masses of Joseph Haydn, who came to Winchester in August 1794 during one of his visits to England. “These twelve settings of the mass, which will be performed over eight concerts between 2017 and 2024, include some of the finest church music ever written. In particular, the last six masses, composed for the annual celebrations of the Feast of our Lady, cemented Haydn’s reputation across Europe at the end of the 18th century. Although often overlooked, in this area Haydn’s achievements exceed even those of his younger contemporary, Mozart. All Haydn’s masses have been recorded several times, but we do not think that any choir has attempted to perform them all live in concert as a series. Seven of the twelve will be receiving their first performances by the Winchester Music Club. Other choral and instrumental works by Haydn will also feature during the series, including settings of the Te Deum and Salve Regina (his earliest known choral work), and concertos for various instruments, most notably his famous Trumpet Concerto. The same concerts will include music by other composers who were contemporaries of Joseph Haydn: Mozart, Beethoven, and Michael Haydn, brother of Joseph. The cycle will conclude in March 2024 at the end of our 99th season, with a performance of Haydn’s last mass, the Harmoniemesse. 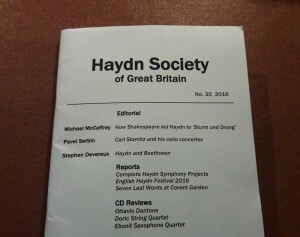 It’s nice to be able to close out this most Sturm und Drang of a year with news of the publication of our Journal issue 35 – which includes a piece from our friend and prolific blogger Michael McCaffrey on how Shakespeare led Haydn to the idea itself. See the Membership page for more detail on how to become a member and so receive a copy of the Journal upon publication. 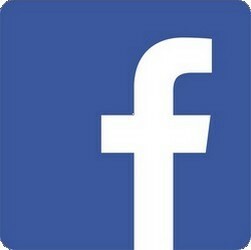 There’s lots more from the Society on day to day issues, including news of Haydn performances in the UK, via social media (Facebook & Twitter), so do join us there.